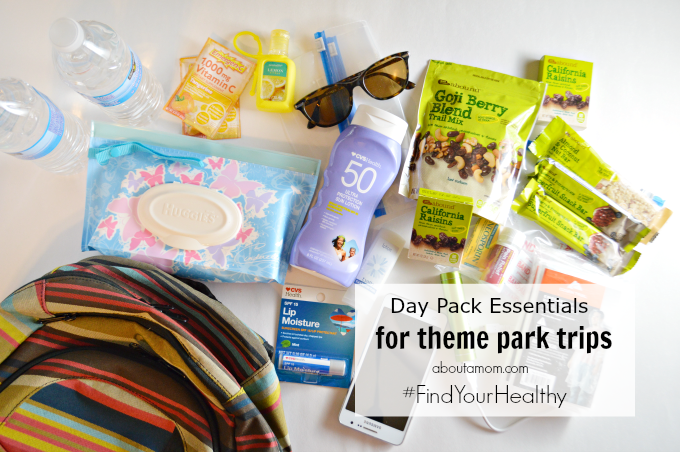 Today I am sharing some day pack essentials for theme parks to help keep you and your family healthy and happy while you are having summer fun at your favorite amusement park. With summer break fast approaching, many families will be heading out to their favorite amusement and theme parks. Here in southeast Georgia, we have some fantastic theme parks that we can easily get to like Six Flags Over Georgia, Disney World, Busch Gardens and Universal Orlando. I’ve learned that showing up prepared can go a long way in making your time at the park more enjoyable. I’ve put together a list of day pack essentials for theme parks that I hope will make your day go more smoothly and maybe even save you a few bucks. We spent Mother’s Day weekend at Disney World, and everything in my backpack was utilized during our four days in the Disney Parks. You can never be too prepared is my motto. A backpack is ideal for a day at a them park. I gave up carrying a purse a long time ago. A backpack will hold more and is much more comfortable, equally distributing the bags weight on your shoulders. While I don’t recommend toting a heavy bag around the parks, there are a few theme park essentials that you really should bring. Plus, you never know when you’ll need that extra space to bring home a few souvenirs. There are always things that can go wrong when you visit a theme park. You will be walking more than normal, and it is easy to get dehydrated or an upset tummy. I’ve certainly had my fair share of sun burns from spending a day at the amusement park. Before heading to the parks I like to pop into my local CVS Pharmacy for a few healthy snacks, sunscreen, and first aid supplies. Here’s a complete list of what I like to bring to the parks. 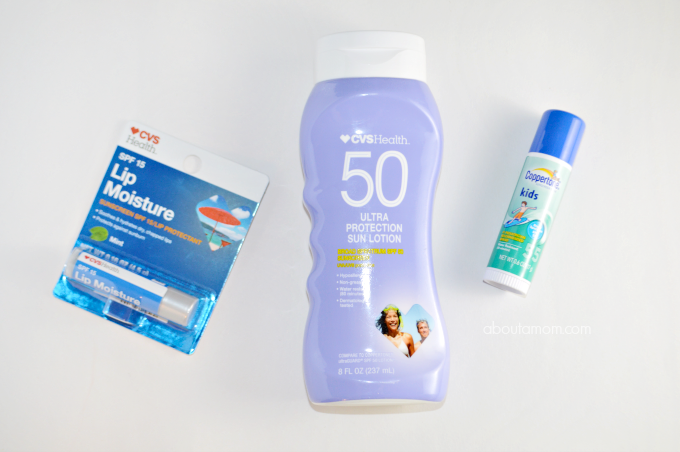 Sunblock – A good sunscreen is essential for a day at the park, especially during the summer months. Apply it before you go, and again while you are there. I’ve learned this the hard way. SPF lip balm – Your lips can get easily get chapped and burned while in the sun all day. A good SPF lip balm is essential. Sun glasses – Both sunglasses and hats will help protect your eyes from the blazing sun. Not to mention, all that squinting will give you more wrinkles. I worry about these things at my age. Ziploc bag – Zippered bags will be your best friend at the theme park. I always stick a few in my backpack to protect our phones and cameras on water rides. If your child only eats half of that $10 pretzel, you can pop it into a bag for later. Snacks – Food can cost you a small fortune at amusement parks. 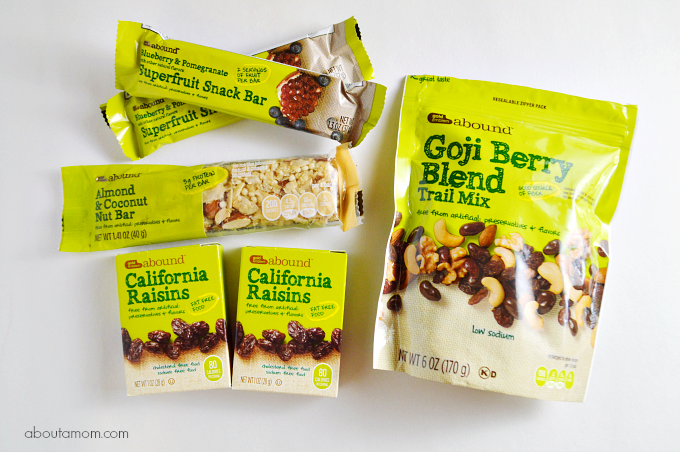 Packing some healthy and filling snacks is an absolute must. My favorites are Trail mix, raisins or other snacks that won’t melt in the heat. I am such a fan of the Gold Emblem abound™ products at CVS. 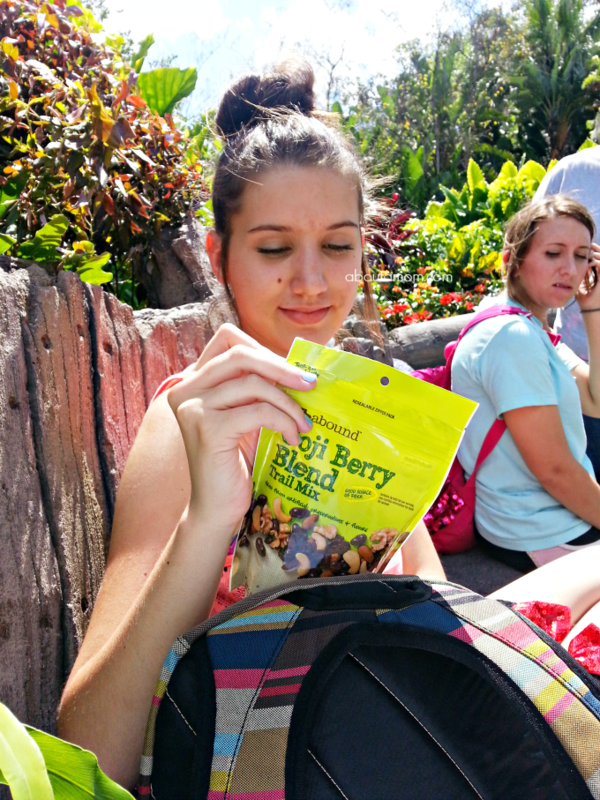 The snack bars and trail mixes are a great healthy snack to take along to the theme park. Bottled water – The Disney parks let you bring in your own bottled water, while other parks like Six Flags do not. Depending on what you are allowed to bring, you’ll want to either bring a few bottles of water or a filtered water bottle. I also like to bring a few packets of Crystal Lite to add to the water, or some Drip Drop or Emergen C to help boost our electrolytes and immune system. Camera – A camera is a must for capturing those family memories. I stopped traveling with my DSLR camera, but still usually bring a good point-and-shoot camera with me. The camera on your Android device or iPhone will take some great pics too, but I like to save the battery on my phone for texting and phone calls. Cell phone and portable charger – My smartphone and portable charger are two things I never leave the house without. Now that my nieces are in high school, my backpack usually ends up holding several phones. 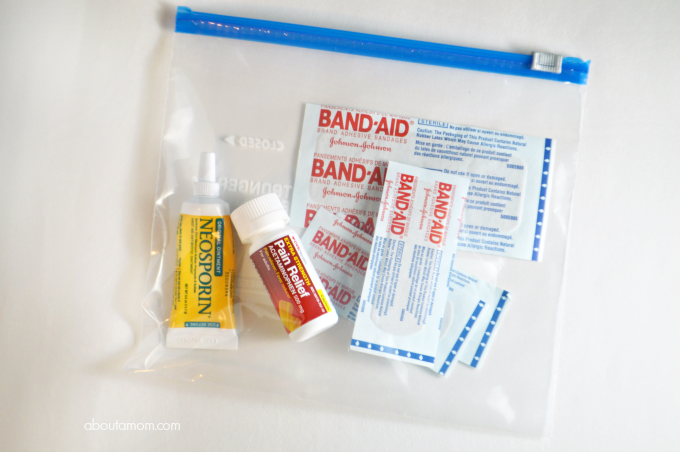 First Aid supplies – I always bring a small first aid kit to the parks. Basically, it is a Ziploc bag with a few band aids, blister patches, and small tube of of Neosporin. I also toss in a travel-size tube of Tylenol. Hand sanitizer – Let’s face it. Amusement parks are jam packed with people which translates to lots of germs. A small bottle of hand sanitizer is essential. Mini hand lotion – While not necessarily essential, I always bring a small tube of hand lotion. Usually one that I swiped from a hotel, or a small purse size that I’ve picked up from CVS. Small pack of disposable wipes – I could probably dedicate an entire post to all the many uses for these. Disposable rain ponchos – Summer showers are a common occurrence here in the South. Don’t get caught off guard. The disposable ponchos don’t take up much space in your backpack, and will save you a bundle. They cost a small fortune in the parks. Staying active and having fun doing things like visiting theme parks with my family is just one of the ways I plan to stay healthy this summer. Preparing a day pack with theme park essentials will surely help! Follow the #FindYourHealthy hashtag for more great ideas. What are some of your day pack essentials for a day at the theme park? Yes! I agree with everything. I never head out for a day at the parks without a backpack full of snacks. These are all great picks. You have to keep your belly full, your body hydrated, and your skin protected from the sun when you’re tootling around the park. Theme parks are so much fun. They’re also so huge! We always make sure we have bottled water and snacks. It’s hard to enjoy anything when you’re thirsty and hungry! You really managed to include an excellent array of travel necessities. Packing snacks certainly saves on overall expenses too! I definitely agree with this list. I always try to bring snacks. That trail mix looks great! I always pack small things like this when I travel. I can’t tell you how many times it has saved me. I totally agree with taking a backpack. 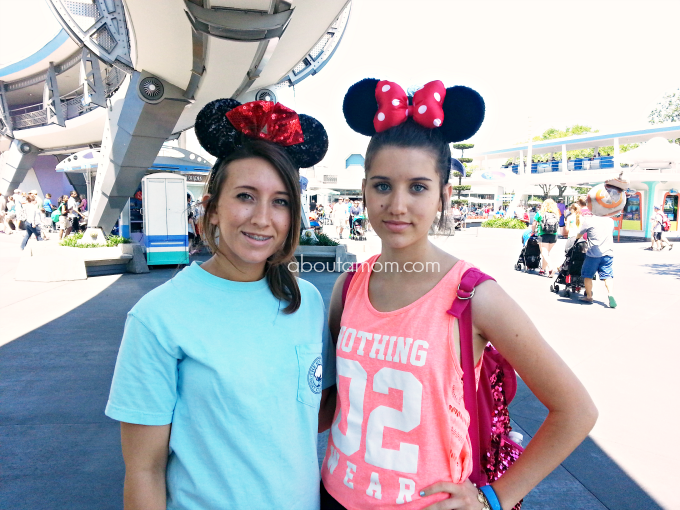 We saved so much on packing our own snacks and first aid essentials by doing this on our Disney trip too! These look like a nice alternative healthy snack. Aside from these tips, I would always bring my favorite mini-cooler. And hand sanitizers! We usually touch a lot of stuff everywhere and it won’t hurt to use one from time to time along the way. We are going to a theme park this weekend. I always pack a change of clothes and sunscreen. I will have to pack a few things from your list. I think you covered it all! We go often – living in Orlando it’s in our backyard. Sunscreen is top priority followed by water and food. The cost of purchasing these items within the amusement park can break the bank. You’re smart to stock up ahead of time! Thanks for sharing your list. Gotta tell this to my wife whenever we go out. These are perfect essentials for a day at the theme park. Those trail mixes look great and would also be great for the car or on the plane. Such good advice. We are also gluten-free which can throw a wrench in things (not always snacks around we can eat). Disney is great though. Last time I went to a theme park, I was single. Now with 2 kids this is great advice to make sure I got every thing I need for a long day! Look theme park food is super expensive so its smart you brought your own. Everyone should have a theme park essential pack thanks for the ideas! Wow this is great advice and many useful things that you can use for emergency. I really never thought to bring band aids our boy is always scraping something especially at the pool the life guards know him now super great tips thx. After having my daughter, it’s always funny to think how more prepared I am when going to places like Disneyland. I would always have to buy the things I forgot but I have my lists down so I can keep the costs down from having to buy sun screen or snacks. Thanks for sharing your list! Super helpful! In addition to what you mentioned, I pack a change of clothes in case a ride gets us too wet, a change of shoes is left in the car in case of emergency blisters. Finally I bring mini fans battery run available at Walmart and target for under 7$. They are great when the sun beats down hot midday and have clips to attach to something so I can hang it around my neck or just attach to a backpack strap!